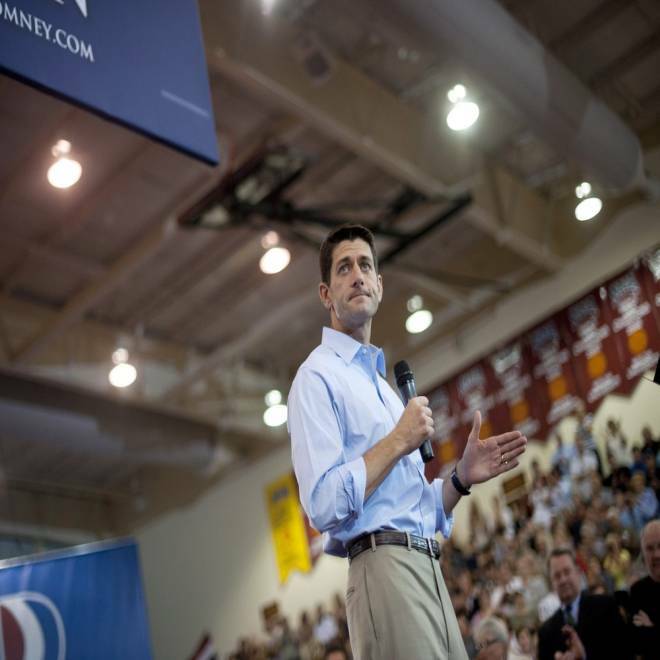 Rep. Paul Ryan speaks at a campaign event at Walsh University on August 16, 2012 in North Canton, Ohio. The Ryan pick -- one week later… The vetting of Ryan (on the stimulus, China) continues… Obama camp makes offer to Romney on his tax returns, ensuring that the tax-return story stays in the news… Just in: Romney camp declines the offer… Team Obama unveils its first TV ad on Medicare (and it’s reactive)… Medicare vs. the Romney-Ryan plan is akin to pensions vs. 401ks… And ad spending in the presidential contest tops $500 million. *** The vetting of Ryan continues: But here’s what we haven’t learned yet: Is the Ryan pick a winner? As one GOP strategist has remarked to First Read, the VP choice could either turn out to be a stroke of genius or it could go badly -- but it’s too early to tell. In fact, Ryan is still being vetted by the national press. Yesterday, we learned that the Wisconsin congressman was talking tough on China’s currency manipulation, even though he voted against a 2010 House bill that would have cracked down on China’s currency manipulation. Also yesterday, he told a Cincinnati TV station that he didn’t ask for money from the $787 billion stimulus when the record shows he did, and he later acknowledged sending the letters to the Energy Department requesting funds for two companies. As we wrote earlier in the week, there’s a potential danger for Ryan sounding a like a typical politician, which would undermine one of biggest perceived strengths. Former Gov. Tim Pawlenty, R- Minn., joins Morning Joe to share his thoughts on not being chosen as Mitt Romney's VP running mate, Paul Ryan's strengths as a candidate, and tax reform. *** Romney’s tax returns stay in the news: In an obvious attempt to keep yesterday's story about Mitt Romney's tax returns in the news, the Obama campaign sent a letter to the Romney camp making this offer: If Romney releases just five years of returns (including the 2010 and 2011 he has given/pledged to give), the Obama camp promises NOT to criticize him for not releasing more. “I repeat, the governor and his campaign can expect in return that we will refrain from questioning whether he has released enough or pressing for more,” Obama manager Jim Messina wrote to Romney manager Matt Rhoades. (Note: This offer doesn’t seem to pertain to WHAT’S IN the tax returns.) This letter is proof of why Romney’s answer yesterday that he paid no less than 13% in federal taxes over the past 10 years was such an unforced error (even though we, as members of the press, give him credit for answering the reporter’s question he was asked). Bottom line: It immediately changed the conversation from something the campaign wanted to talk about (Medicare) to something it probably didn’t (the tax returns). But there’s a bigger public-policy issue here: 13% is a VERY low number for a multimillionaire like Romney, and it demonstrates how the current rules (and loopholes) benefit the wealthy. *** Obama camp unveils its first TV ad on Medicare: Meanwhile, the Obama camp is it up with its first TV ad on Medicare, and it’s a response to the Romney camp’s attack on the subject. “The non-partisan AARP says Obamacare cracks down on Medicare fraud, waste, and abuse and strengthens guaranteed benefits,” the ad’s narrator says. “And the Ryan plan? AARP says it would undermine Medicare and could lead to higher costs for seniors. And experts say Ryan’s voucher plan could raise future retirees’ costs by more than $6,000.” What is surprising is that Team Obama waited a week to unveil an ad like this -- and what’s more surprising is that it’s a reactive ad. That development has Boston grinning, because Democrats are playing defense on Medicare -- especially regarding those $716 billion in cuts. David Gregory, host of NBC's "Meet the Press," speaks with TODAY's Savannah Guthrie about the ongoing inquisition into Mitt Romney's financials and whether or not his running mate, Paul Ryan, has helped the GOP ticket. *** Ad spending tops $500 million: As another of us wrote yesterday, ad spending in the presidential contest has now crossed the health-billion-dollar mark. “With the $37 million being spent this week on political advertising -- including the campaigns and the Super PACs that support them -- the grand total for this campaign is now more than $512 million, about the amount spent on advertising in the entire 2008 general election, according to an NBC News/Smart Media Group Delta analysis. Almost half of that money is coming from outside groups, like Super PACs -- and the vast majority of the outside money is going to support presumptive Republican nominee Mitt Romney.” As NBC’s Brian Williams pointed out last night, this $500 million is a staggering sum, and could easily be used to pay for other things, such as feeding 9.2 million malnourished children. Click here to sign up for First Read emails. Text FIRST to 622639, to sign up for First Read alerts to your mobile phone.